Every year on our birthdays, my friend Brett and I exchange “Birthday Beers”, where we try to get something new for each other. His happened to be last week, and I decided to change it up a little and get him something that we had both been talking about trying: Smith & Forge Hard Cider. We are both fans of Woodchuck Cider, and had experimented mixing that with a Sam Adams Boston Lager to create a “Snakebite”. It is the perfect beer cocktail for early fall, when the season is changing and it is still slightly warm out. Anyway, I enjoy the commercials that Smith & Forge uses, which comically end with the main character saying the product is “not too sweet”. The drink, surprisingly, comes as advertised, and ended up being highly enjoyable. While it’s not radically different from Woodchuck, this definitely comes a bit more tart and tasting like a fresh granny smith apple. 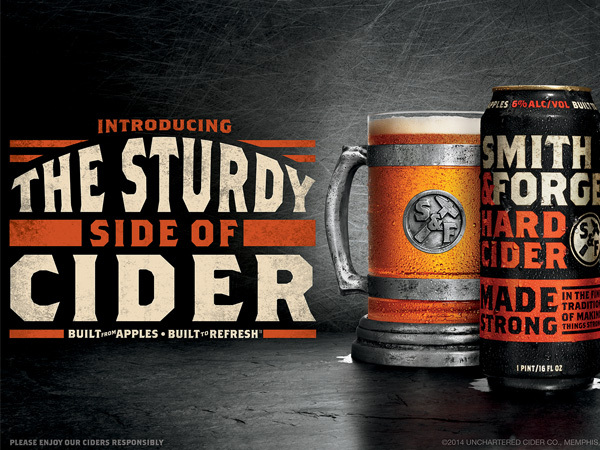 While other brands try to come across as part cider, part beer, there is no identity crisis here. This is an apple cider, fresh and just like the commercial says, not too sweet. There is a very natural taste here, and you truly feel as if you are drinking freshly pressed apple juice but with a slight kick. The company lists nutrition facts and the ingredients, which help to lend to that all-natural feel. Overall, it is a smooth downing with a nice pucker that dances all over your taste-buds. Get it for the person who loves apple but isn’t big on a strong sweetness.